Dental hospitals in Hyderabad are well equipped with modern and latest equipments and facilities with finest doctors to be on par with world-class dental institutions. Dental hospitals in Hyderabad offer dental services in Cosmetic dentistry, Dental X-rays, Implants, Mouth rehabilitation, Orthodontics, Root canal treatment, Smile designing and many other emergency and specialty dental care. 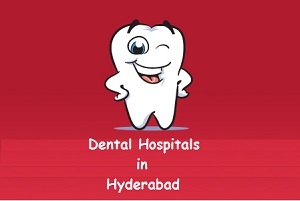 Find below the list of dental hospitals in Hyderabad along with their address and contact details. i want to take the dental treatment, can you tell me about the cost of orthodontic braces? and also suggest me the best dentist in the city? Hi!Actually there are number of professional dentists in Hyderabad who can provide orthodontic braces. You can choose the one depending on your dental need and budget. a very helpful article and thanks for giving the information about dental hospitals in hyderabad. can you give me a rough idea about the cost of root canal treatment in hyderabad city? Hi! Cost vary from one dental professional to other and so it would be wise to consult them in personal .